The four images show a set of windows that were completed for a villa being built in Paxos, Greece. 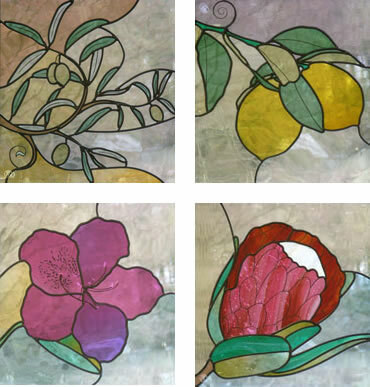 They are based on local Greek trees and flora, hence the olive, lemon, rhododendron and protea. All these windows were made entirely with mouthblown glass and were designed to appear as a set as they are all exactly the same size, two in each of two rooms in the house.